My work about Mark Clark and his treatment by the Journal Star isn’t just some retelling of events starting in the ’60’s & ’70’s. It absolutely informs today, especially when it comes to the issue of the newspaper’s relationship to Peoria’s African-American population, and every other non-power community in central Illinois. But Anderson forgot, or more probably was never even aware, of his newspaper’s all too purposeful and direct engagement with the South Side’s African-American community that had been going on for decades. And a huge part of the reason for the disconnect to irrelevancy he lamented between the city’s paper of record and Peoria’s largest minority community might just be that the Journal Star attacked and belittled African Americans precisely at the time the community needed their newspaper the most. When Mark Clark, leader of the Peoria chapter of the Black Panther Party, was gunned down December 1969 in what amounted to a police death-squad execution aimed at Illinois BPP Deputy Chairman Fred Hampton in Chicago, the Journal Star used racist descriptions like “ex-convicts,” “jobless,” and “not overly bright” about Clark and his comrades, people who operated a free children’s breakfast program in Peoria and across the nation. The cop gunners were also targeting Illinois BPP Chairman Bobby Rush, who fortunately was sleeping elsewhere. Mr. Rush, a Democrat, has ably served as US Congressman for the Illinois 1st District since 1993 and remains the only man to ever beat President Barack Obama in an election campaign. Just a few months after the Clark/Hampton murders, Peoria residents vs. police conflict exploded across the South Side’s Taft and Warner Homes public housing units and beyond when two women residents were evicted with little or no due process. “The violence erupted when a group of about 50 youths returned the furniture of Dorothy Johnson to her apartment from which she had been evicted in the morning (of July 23),” noted the Journal Star 1970 news article. During the clashes, some of the most extraordinary, memorable violence occurred when the Taft Homes offices of the Peoria Housing Authority were gutted by fire bombs. Burned out. According to published reports at least 17 arsons, 12 shootings with six people injured (at least two in separate Southside taverns) and about 40 arrests occurred. A state of emergency – including night-time youth curfews, closed taverns, and prohibitions on bulk gasoline sales – was declared by city officials during three nights of violence primarily between police and black residents in July 1970. Five days after the initial contested evictions and resulting mayhem began, the lead Journal Star editorial was provocatively titled “The Black Saboteurs.” It included no details about the root causes or any attempt at honest analysis of the locally infamous Taft Homes Riots. 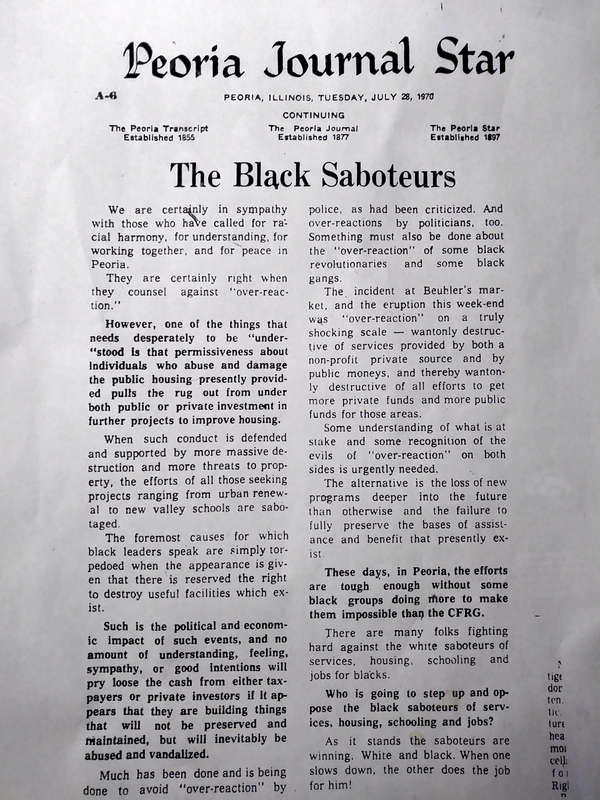 The Black Saboteurs bolded title pretty much summed up the paper’s position clearly and quickly. So, for me, these glaring omissions in Anderson’s Guardian article were too much to take. Too divorced from reality to just read and do nothing. 1). Would the Oct. 1, 2017 Guardian article by Dennis Anderson have been printed in its current form if your newspaper had been aware of the past Journal Star editorials? 2). Was the Oct. 1, 2017 Guardian article by Dennis Anderson edited or fact-checked by your staff? 3). Did Mr. Anderson write the headline? 4). What is the Guardian’s position on institutional responsibility by newspapers for past actions/positions taken, regardless of whether it happened 1 year ago or 10 years or even longer? I also forwarded copies of the older Journal Star work in question, and waited. The Guardian replied after further prompting by claiming the Anderson piece was part of something called “Comment is Free” although the article has no such header or identifying text with that wording. The tag “comment” was included as the very last word at the very bottom of the work, but that obviously did not serve as any kind of identifying label to any lay reader, and probably not to 90 percent of any media or academic audience. See for yourself; the tag is still there. I certainly took the article as a news piece, exactly the way it was presented online. When I pointed out this incredibly relevant fact, that there was no label identifying the piece as anything other than a straight news article, The Guardian was forced to specifically and clearly label the Anderson article with the unmistakable bold black header “Opinion”. And it remains that way now. But for weeks, readers took that piece as competent and complete journalism when it clearly was no such thing. 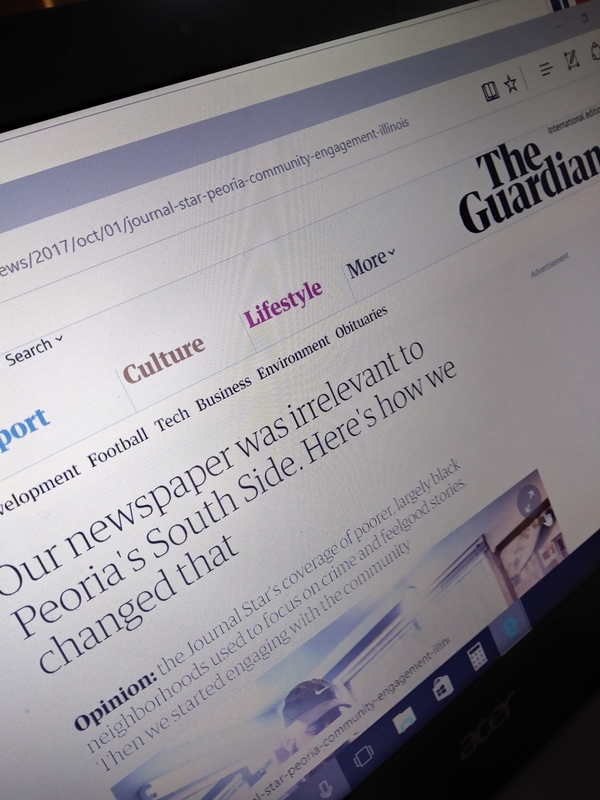 Even now, the url address for the article remains https://www.theguardian.com/us-news/2017/oct/01/journal-star-peoria-community-engagement-illinois. You see the letters following immediately after theguardian.com? Looks like “us-news” to me. Not us-opinion or us-comment. News. At least that’s what they ridiculously tried to pass it for. It just rings so hollow, this badly incomplete Guardian piece the executive editor of the Peoria Journal Star attempted to foist off on America and the world via a respected international publication as a means to congratulate his tenure on the masthead. The paper wanted to be seen as valiantly calling itself out for benign neglect — heaven help us! — when the truth was closer to media-sponsored racism spewing from the front doors at 1 News Plaza. If Dennis Anderson had taken the time to responsibly know just a little bit about the recent turbulent past of the city his publication works for, and how his paper responded to those times which remain fresh in the minds of countless numbers of Peorians, then I’m pretty sure he could never have written that his paper’s coverage on the South Side had been restricted primarily to arrest blotters and feature powderpuffs. He would have had to admit that the unacceptable words and positions of his newspaper dating back at least to Mark Clark and the Taft Home Riots were in many ways directly responsible for whatever community disconnect existed then and exists now. I certainly believe that any fair-minded reading of the facts would lead most people to the same conclusion. I just wish the Peoria Journal Star would finally come to grips with its recent past, and display some institutional responsibility and genuine remorse on the very pages where it all started. People would respect that. No one needs any more monthly meetings. My efforts last December resulted in the clear relabelling Opinion for this pat-on-the-back piece previously online as a news article for weeks.